The Mexican Red-kneed Tarantula is a gorgeous, friendly tarantula that's great for beginners! The Mexican Red-kneed Tarantula Brachypelma smithi is a burrowning species originating in Mexico. This spider has been, and is still, the most popular pet spider in the hobby. They make an excellent tarantula pet for novice keepers. They have a good temperament, are hardy and long lived, and the lifespan for females is over 25 years in captivity. The Mexican Red Knee is a striking spider, and Its common name says it all. They have a strong contrasting coloration, a dark tan and black body with bright orange patches on the joints of the legs. They are a medium-sized terrestrial species with adult females reaching a leg span of up to 6 inches (15 cm). Males are comparable, because they are smaller bodied but with longer legs. The Red-kneed Tarantula is one of the most docile species available. They may rear up when agitated and will even occasionally flick urticating hairs from their abdomen and back legs .But after a short display they will beat a hasty retreat, or more commonly will simply walk away. These tarantulas make wonderful pets. Mexican Red-kneed Tarantulas are successfully bred in captivity. Captive bred specimens are found in the United States and are imported from successful breeders in Europe. 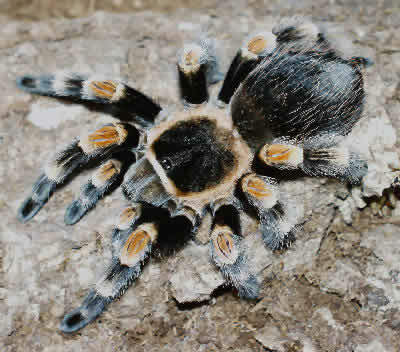 The B. smithi is protected by CITES, so imported specimens require special permits for transport or transfer between countries. Habitat: Distribution/BackgroundMexican Red-kneed Tarantula Brachypelma smithi was described by Cambridge in 1897. They originate from Mexico and are found on western faces of the Sierra Madre Occidental and Sierra Madre del Sur mountain ranges. They are a burrowing species living in deciduous tropical forests in the hilly terrain. Other common names it is known by are Red-kneed Tarantula and Mexican Red Knee Tarantula. StatusThe Brachypelma smithi are on the IUCN Red List for Endangered Species as Near Threatened (NT). All species in the genus are listed on CITES (Convention on International Trade of Endangered Species) as Appendix II species, meaning they are threatened and requiring special permits for transport or transfer between countries. There status is said to be in need of review, but they are not currently a regular import from Mexico. They are successfully bred in captivity and those specimens are readily available as pets. Description Mexican Red-kneed Tarantula is a stocky species. It has a striking tan and black carapace, dark abdomen and legs and red-orange patches on the joints of its legs. Adult females can have a leg span reaching up to 6 inches (15 cm), with males being smaller bodied but with longer legs. The Mexican Red knee is a dark spider overall with a black abdomen covered with brown hairs. Its characteristic legs have orange to dark red-orange "knees" and it commonly has some smaller patches of orange on the legs. They have a long lifespan, and slow growth is a characteristic of most long-lived species. Female specimens which have been in captivity for over 25 years are common. Food and Feeding The Red-kneed Tarantula will feed aggressively on large insects and large specimens can be fed an occasional pink mouse (once every couple of months). HousingThe B. smithi lives in deep burrows along the Pacific Coast of Mexico. A captive enclosure for the Mexican Red-kneed Tarantula should try to mimic these conditions. In a ten-gallon enclosure, use a deep (6 to 8") substrate composed of a mixture of slightly damp sand and peat moss (50/50 ratio). Add a cave-like shelter at one end and begin a burrow under this shelter. The spider will typically continue the excavation. Keep the enclosure in the 78° to 82° F range. A heat lamp with a 60-watt bulb over an area just outside the entrance to the burrow will provide the needed warmth. In nature, this species will often "bask" at the entrance of its burrows and will even drag egg sacs to this area to warm the developing embryos within the egg sac. They require low-moderate humidity, around around 55% is adequate. Cage CareA good habit to get into is cleaning up any uneaten prey items the day after feeding your tarantula as decaying organic matter commonly attracts mites, fungus, mold and other potentially harmful organisms into the enclosure. If your pet has recently molted, remove uneaten prey items immediately. Newly molted tarantulas are vulnerable until their exoskeletons hardens. Behavior The Red-kneed Tarantula is one of the most docile species available in captive collections. They may rear up when agitated and will even occasionally flick urticating hairs. After a short display, they will beat a hasty retreat or more commonly will simply walk away. These tarantulas make wonderful pets. Handling A keeper should carefully pick up these tarantulas by cupping them gently with the legs folded under their bodies. Another, gentler method is to simply place a hand out flat in front of them and gently prod the tarantula's abdomen, forcing it to walk onto the hand. As they walk, simply place the other hand in front and have the spider walk across your hands. These tarantulas make wonderful pets. Reproduction The Mexican Red-kneed Tarantula can be bred in captivity if certain pre-mating conditions are maintained. The females seem to benefit from a cooling period of a couple of months prior to mating. Once a mature male is produced, and he makes a sperm web, he should be introduced into the female's enclosure. He will approach the female's shelter cautiously, tapping and vibrating his legs. The female will be "lured" out of her burrow or shelter and the male will typically lunge forward to use his hooks to hold the female's chelicerae and to push her into an almost upright position to give himself access to the female's epigyne for mating. The male will insert either the left pedipalp, right pedipalp, or both alternately into the female's epigyne and inject the fertilizing fluid into this area. If fertilized, the female will produce an egg sac in the following weeks. This species produces large egg sacs, usually containing in excess of 250 babies. A mature male can be introduced to multiple females or can be reintroduced to a female to enhance the possibilities of a successful pairing. Typically, the male will die in the weeks following a successful mating. Red-knees and many of the terrestrial species from North and Central America have confused tarantula breeders. Often a pair will mate but the female will never lay eggs. Occasionally a female will lay eggs, fold up her egg sac, and either eat it or abandon it after a few days. We are experimenting with conditioning females by cooling them in a wine cooling rack. We believe that perhaps these females need some "triggers" to breed and produce spiderlings successfully. Growth rate of the spiderlings is slow compared to many species, but adulthood can be reached much faster when spiderlings are placed on a frequent feeding schedule. Some "pushed" animals have reached adulthood in five years (males) to seven years (females), well ahead of reported growth parameters. This slow growth is characteristic of most long-lived species. In fact, female specimens which have been in captivity for over 25 years are common. Diseases: Ailments/TreatmentsTarantulas are generally quite hardy and adaptable if they are provided with the right environment. A few signs that may indicate that your pet is not acting or feeling normal are a loss of appetite, lethargy, looking overly skinny, or pacing the enclosure. A tarantula on its back is probably not sick. Most tarantula species flip onto their backs during molting. Though this is a very stressful and delicate time for tarantulas, if the humidity and warmth levels are correct, they will molt their exoskeleton, roll over, harden up, and within a week or two be ready for their next meals. One of the most common reasons for your pet to demonstrate unusual behavior is due to a molting period. As they outgrow their existing skin all tarantulas regularly go through an extensive molt, shedding their entire skin as well as the linings of their mouth, respiratory organs, stomach and sexual organs. The process starts well before the actual molt. For several weeks prior to shedding they will be growing a new skin under their old one. During this time it is not unusual for a tarantula to get quite lethargic and even stop eating. There may also be lots of web spinning activity as they prepare to molt. When they begin to molt, they lay on their backs with their legs up in the air looking as if they are dead. Be sure not to disturb your tarantula when you see this. The shedding process goes quickly and smoothly as long the environment has adequate humidity. Once they have shed, their new skin is pale and very soft. The amount of time it takes for your pet to fully recover and be back to eating well will vary from a day or so up to several weeks depending on its size. Smaller spiders recover much quicker than larger ones. Other problems are usually the result of some type of environmental stress. There may be a drop in the temperature of the enclosure, there may be parasites, or the tarantula may just not be comfortable with the depth of its hiding place. These things can be easily adjusted or changed, or you can try moving your pet to a new enclosure. Availability As one of the most popular species in captivity, the Mexican Red-kneed Tarantulas are often available from dealers and breeders who have produced an egg sac, or purchased specimens from successful breeders in Europe. This species, protected by CITES, must be accompanied by paperwork and importation documentation when they are imported from outside the United States. What is a good price for an adult male? well i have a mexican fire leg terantula , she is a female and she is 4 years old now had her for a month now!the day we got her the guy threw in 10 crickets and she ate them all in one day!he said that we should feed her in 2 weeks time again , well we tried but refuses the food she also closed up the entyrance of the hide but she is not inside the hide but standing on top of it , you can see there is in thin layer of web on top of the hide aswell!! !it is ofcourse winter by us now at the moment but my room get alot of sun during the day witch heats up the room, and no there is no direct sunlight on her!!! !please help me im so worried!!!! !